To know Donald J. Trump it is best to start in his natural habitat: Palm Beach, Florida. It is here he learned the techniques that took him all the way to the White House. Painstakingly, over decades, he has created a world in this exclusive tropical enclave and favourite haunt of billionaires where he is not just president but a king. The vehicle for his triumph is Mar-a-Lago, one of the greatest mansions ever built in the United States. The inside story of how he became King of Palm Beach—and how Palm Beach continues to be his spiritual home even as president—is rollicking, troubling, and told with unrivaled access and understanding by Laurence Leamer. In Mar-a-Lago, the reader will learn how Donald Trump bought a property now valued by some at as much as $500,000,000 for less than three thousand dollars of his own money; why Trump was blackballed by the WASP grandees of the island and how he got his revenge; how Trump joined forces with the National Enquirer, headquartered nearby, and engineered his own divorce; how by turning Mar-a-Lago into a private club, Trump was the unlikely man to integrate Palm Beach’s restricted country club scene, and what his real motives were; what transpires behind the gates of today’s Mar-a-Lago during “the season,” when President Trump and assorted D.C. power players fly down each weekend. 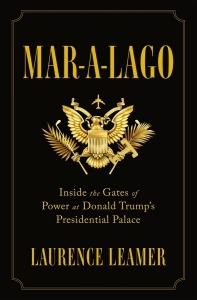 In addition to copious interviews and reporting from inside Mar-a-Lago, Laurence Leamer brings an acute and unparalleled understanding of the society of Palm Beach, where he has lived for twenty-five years. He has written an essential book for understanding Donald Trump’s inner character, in the place where he can most be himself.